The ultimate success of a company is predicated on exceptional customer service experiences. For post-sales service, Consumer Reports ranked Apple Customer Service ahead of other companies for best PC tech support with the company scoring an 86 out of a possible 100 points. The survey included 6,313 owners of PCs and laptops and explored their experiences with technical service over the past year via telephone, online communication, and in-store help. Apple students learn the lessons taught in most service industry jobs, and that is one of being helpful and knowledgeable. With that comes the soft approach; don’t be pushy. Build a confident relationship with a customer, and find out what they need and then present choices as what to buy. Hear the customer out, and as the deal is finished, let it be done in such a way that the customer feels he is the one who made the choice. In practice sessions, the new Genius puts himself in a customer’s shoes in order to understand every interaction and how to successfully mingle skills and sentiment into one satisfying and successful endeavor. The learning techniques have become so refined as Geniuses learn to take ownership, have respect, and show empathy to achieve those good vibes which affect all of us while we consider buying a product. The best sales people are those who customers genuinely like; those of us who know how to make customers happy before, during, and after the sale. The Apple Genius Bar is a cheery place to visit; perhaps not the “happiest place on Earth,” but darn close in the technical world. 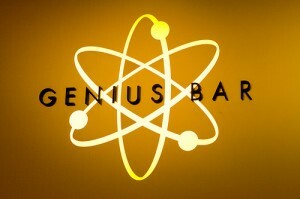 I too am a fan of the Apple genius bar service. Despite going in frantic with a dead phone (cut off from the world!!!) they kept their cool and had me set up with a new phone in no time. I appreciate the APPLE acronym and will share that in my customer service training discussions. I would love to get my hands on their training manual.